One of the downsides with earlier versions of the vCenter server appliance or VCSA was the lack of a native backup mechanism within the appliance to perform backups of your vCenter data. With VMware vSphere vCenter 6.5 and the new VCSA 6.5 appliance, we have the new native backup ability within the appliance VAMI interface to perform backups of our vCenter database, events, configuration, etc. 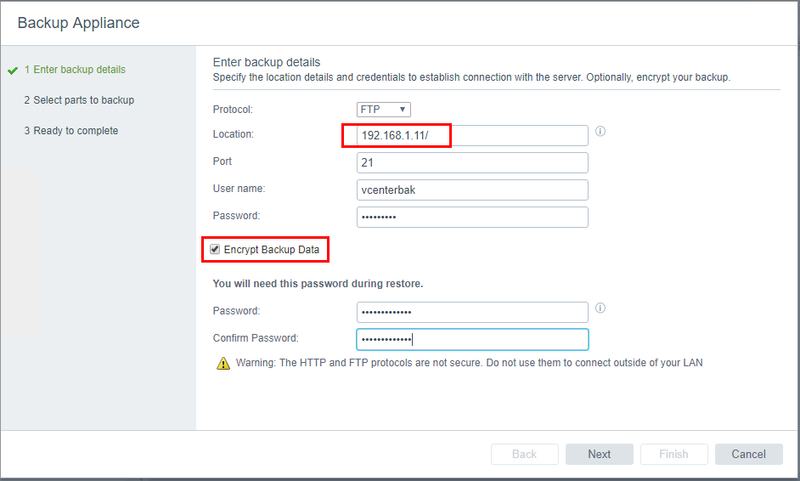 The native backup mechanism allows us to quickly and easily capture backups of our VCSA appliance and have these available in case we need to restore our configuration. 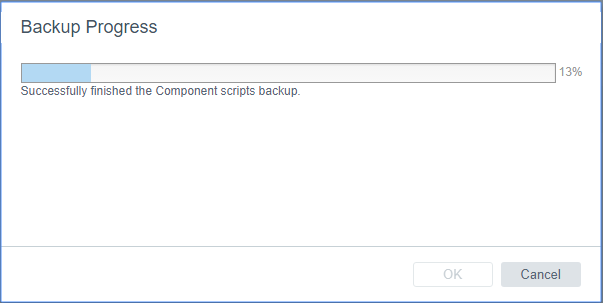 Let’s take a look at what we need to configure to be able to capture our VCSA backups and the actual process required to setup the backup itself. 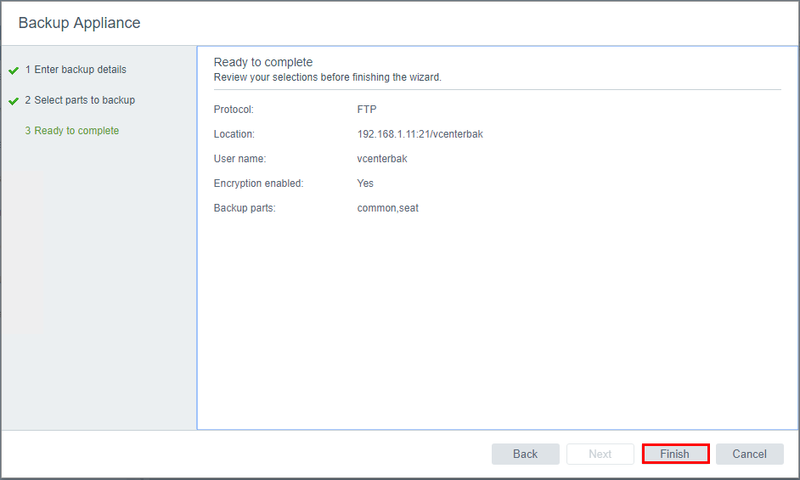 The first step to getting ready to perform a backup of our vCenter Server Appliance is to setup a server that can be used as the target for the HTTPS, HTTP, SCP, FTPS, or FTP backup connection from our VCSA appliance. 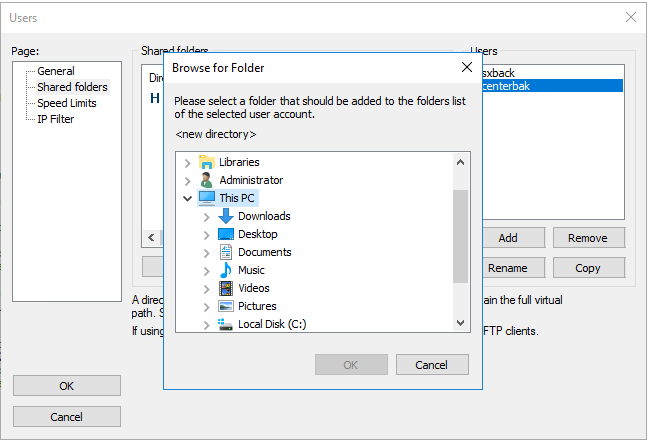 For the purposes of the following lab, we are using the Filezilla FTP server loaded on a Windows server that provides the target connectivity to our backup process from our VMware VCSA appliance. While the process to configure a specific application may be different from vendor to vendor, the basic steps required are the same. We setup our listening service on the server side along with credentials to authenticate and a target directory where our backups will actually be placed from our VMware VCSA appliance. 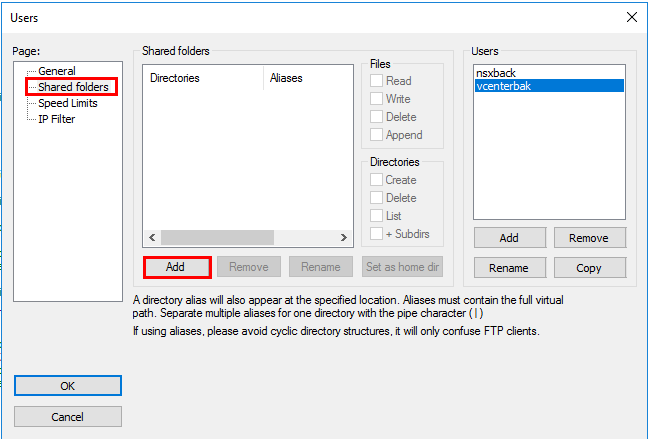 Below we have loaded Filezilla FTP server and we are looking at the general settings of configuring the server. 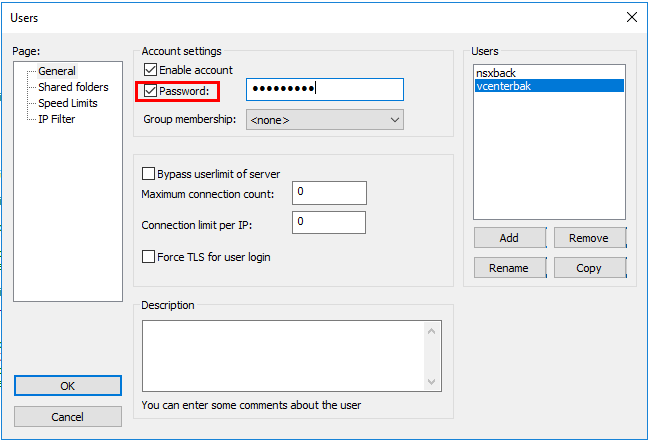 We need to add a user account we can use to authenticate to the Filezilla server from our VCSA appliance. We name our user that we want to be used with the vCenter server appliance backup. 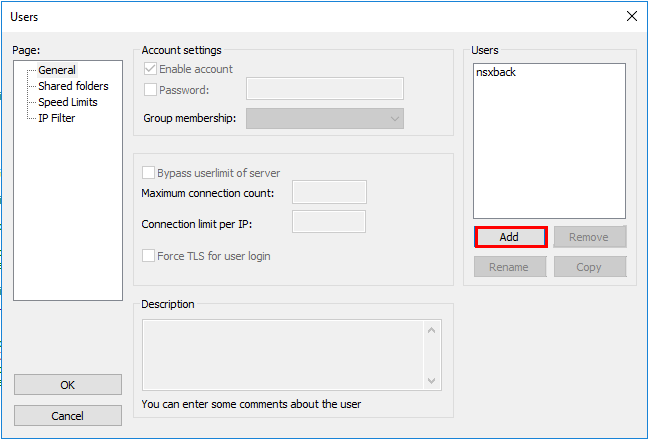 Note we can utilize groups here, however, we don’t have to as we simply need a user with permissions to connect to the server and write the files in the directory. 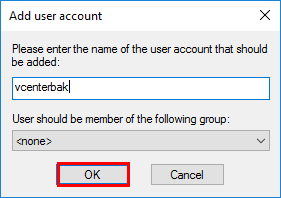 We can click the Password box and set a password for our user. If we click the Shared folders option we can click Add and set a directory as the home directory. Here we can browse out to the folder we want to set as the home directory for uploading files. For the lab, I simply gave all permissions to the user – Read, Write, Delete, etc. However, you only need write, create directories, and read. Now that we have our FTP server setup and ready to go with a user, password, home directory, and permissions to that directory, we can setup our VCSA appliance backup. 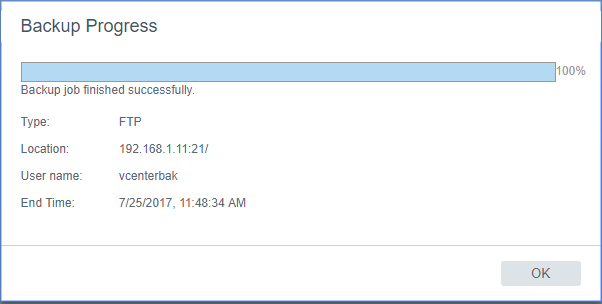 To setup the backup, we login to the VAMI interface of the VCSA appliance which is a different port than the standard vSphere client interface. To access, navigate to the https://<vcsaappliance:5480> address. 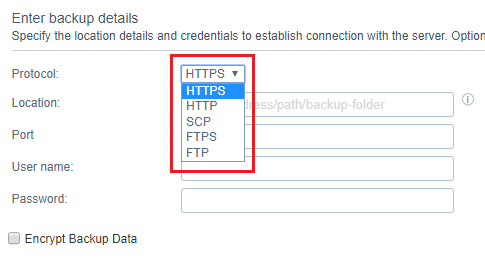 Just a quick look at protocols that are supported for the VCSA backup – HTTPS, HTTP, SCP, FTPS, and FTP. Some noted configuration below are the Location which is the address of our FTP or other protocol server. Note the trailing “slash” after the server address. We need this if we simply want to target the home directory without utilizing a subdirectory. The User name, and password are the credentials we configured above on our FTP server. Also, note how we can Encrypt Backup Data for additional security measures. We do see the note about HTTP and FTP protocols being unsecure. Once we click Next, we move on to the screen where we can select the parts of our appliance that we want to backup. A note here as shown, the minimum components to restore the appliance configuration will be backed up by default. We can uncheck stats, events, alarms, and tasks if we choose. After a few moments, we will see the sizes for both estimated. Finally, we are ready to complete our backup configuration. Click Finish to begin the backup process. We will see the backup process progress as various components of the configuration are backed up. Finally, we should see the backup job finish successfully. 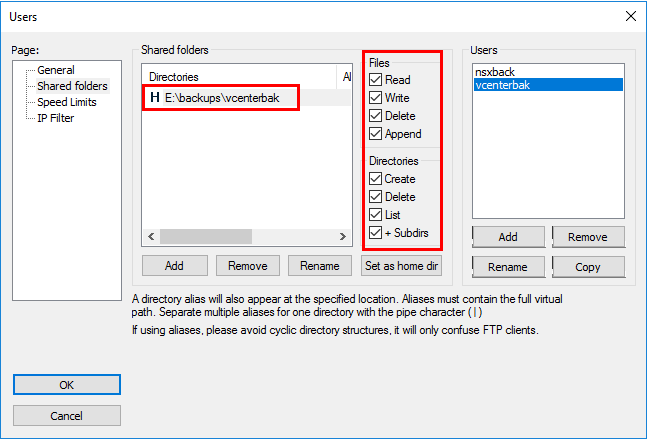 If we look at our backup directory on the server after the backup completes successfully, we will see the backup files populated from our appliance. 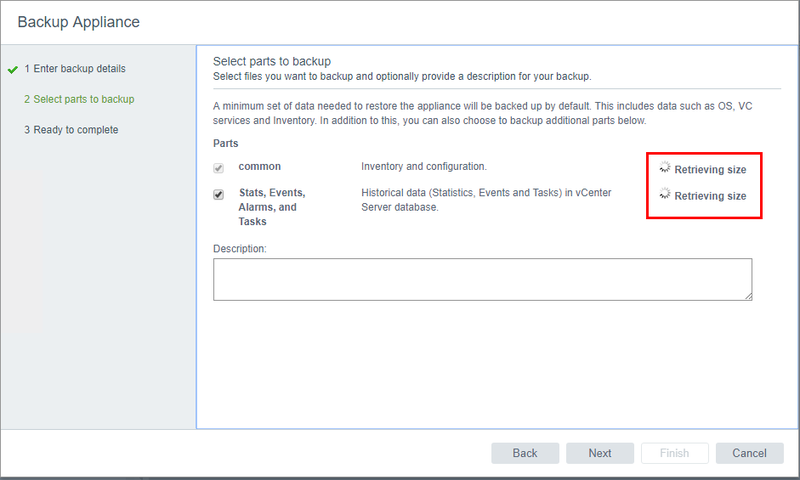 The new mechanism to backup the VMware vSphere vCenter Server Appliance in the vSphere 6.5 release provides a great way to backup the VCSA configuration. We lacked this native ability in version 6.0.X and lower which made it more difficult to recover a configuration to another appliance or restore the existing appliance to a functional state. Using this backup process in conjunction with a CBT backup of the VCSA appliance using Nakivo Backup & Replication makes for a robust solution of having all the bases covered in protecting our vCenter environment. Having good backups in place for vCenter becomes crucially important when we use VMware technologies such as the vSphere Distributed switch that lives at the vCenter level. Be sure and leverage this new backup functionality with the VCSA 6.5 appliance as it provides an additional reason to upgrade VMware vSphere environments from 6.0 to 6.5.